Think of the bottom of the window as parallel to the bottom of your paper and the side of the window parallel to the left and right edges of the paper. The horizontal of the window correspond to the horizontal and vertical of the paper. 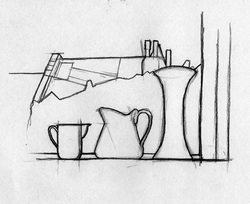 Draw the jugs and vases paying particular attention to the spaces between them and the shapes they make against the window. Imagine you are creating a map to guide someone around and between the shapes. Don’t try to make them look round. Judge the direction and angle of the edge of each object against teh horizontal and vertical of window/paper edge. Try not to name things such as jug, cup , handle , windowsill It is almost impossible to stop the ‘inner speech ’of our mind when we draw. When words do fill your head try to make them the words that help you to find a direction (up/down, left/ right) or appreciate a shape (bigger than, smaller than).If you find this hard try to give shapes, especially negative ones another name - eg it looks like a bell, fish, the shape of an ear etc. This helps you to look at it as a shape rather than a thing. Do not use tone – block in shapes to make them clearer to see if necessary but do not worry about dark or light.